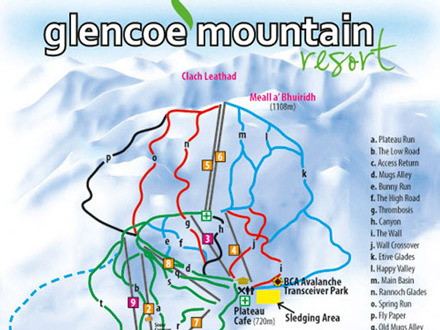 Scotland’s oldest ski area, Glencoe Mountain (360m-1070m) is located on Scotland’s west coast and offers spectacular views of the Buchaille Etive Mòr and Rannoch Moor. Terrain is evenly balanced between beginner, intermediate and advanced. Glencoe boasts some of the country’s best steeps, among them the Fly Paper, which has an altitude drop of 500m and is renowned for being Scotland’s steepest pisted run. 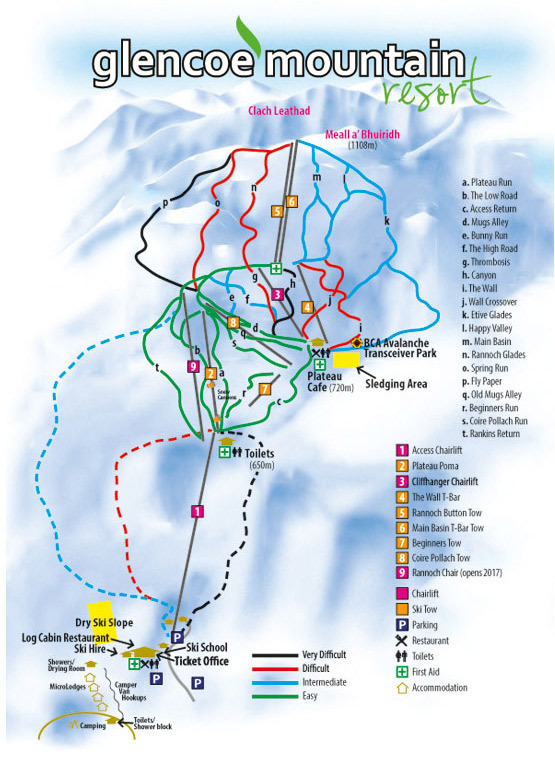 In total, the ski area has 24km of slopes spread out over some 20-odd runs. The ski area has 9 lifts, including the new three-person Rannoch Chair. On good days, the mountain has some excellent off-piste possibilities to the left of the Access Chair. Higher up is a plateau with the nursery slopes, and higher up still the intermediate area with a good assortment of red and blue slopes and the infamous steep black piste, the Fly Paper. As always in Scotland, snow cover is not guaranteed and it’s best to check the weather report before venturing up to Glencoe. Although there is no real town attached to the ski area, there is a small campsite at Glencoe Mountain itself with a fully licensed bar. The tiny town of Glencoe is about a twenty-minute drive away, but most visitors to Glencoe ski area choose to stay in Fort William.